There is one certainty at the end of the fourth day in Mohali: there will be a winner. The hard part is predicting who. That alone was a good result after a day that began with a draw as the short-priced favourite. But fine bowling from Ishant Sharma, Zaheer Khan and the Indian spinners set up a gettable chase of 216, before Ben Hilfenhaus bowled Australia to a winnable position of their own late in the day. It left the Test finely balanced; India require 161 runs with Sachin Tendulkar at the crease on 10, and the night-watchman Zaheer on 5. Australia need six wickets, but they know that VVS Laxman, who batted at No. 10 in the first innings, would again be hampered by his bad back when he eventually comes to the crease. Much will depend on Tendulkar and MS Dhoni. The target seemed small enough, but if the hosts triumph it will be the fourth-highest successful chase in Tests in India. The loss of Gautam Gambhir to a dodgy lbw decision - Billy Bowden failed to spot an inside edge - in the first over from Hilfenhaus gave the Australians a spark. Doug Bollinger helped out with the wicket of Rahul Dravid, who edged behind for 13, before Hilfenhaus bounced out Virender Sehwag for 17 and Suresh Raina for a duck, both caught in the cordon fending away chest-high deliveries. The extra bounce was a pleasing sign for Australia's fast men, after little assistance for the bowlers on the first three days. The Australians began the fourth day in a positive mindset, taking forward their 23-run first-innings advantage. A brisk half-century from Shane Watson rapidly took the lead into triple figures, before Ishant provided the first turning point of the day with three wickets in two overs just before lunch. Shane Watson became only the third Australian, after Damien Martyn and Allan Border, to score a century and a half-century in the same Test in India. Martyn scored 114 and 97 in Nagpur in 2004, and Border made 162 and 50 in Madras in 1979. Zaheer Khan became the fifth Indian bowler to pick up 250 wickets in Tests. He has a strike rate of 58.6, the best among those five bowlers. Both Simon Katich and Mike Hussey reached the 4000 run mark in the second innings in Mohali. It was the 53rd Test for both batsmen. Virender Sehwag's average in second innings in Tests fell to 30.35 after his dismissal for 17. He has 20 centuries at an average of 69.69 in the first innings but only one hundred in the second innings. Ricky Ponting has been dismissed by Ishant Sharma six times in Tests. Only three bowlers have got his wicket more often. In truth, Ishant's first wicket was more luck than outstanding bowling, as the aggressive Watson bottom-edged his attempted pull into the stumps and departed for 56. It was just the boost that Ishant required after a first-innings hampered by injury and inconsistency, when he returned 0 for 71 from 11.4 overs. Four balls later, Ricky Ponting pulled Ishant to square leg, and the bowler thought he was on a hat-trick when Michael Clarke chipped the next to midwicket for what appeared to be a golden duck. But Ishant delivers no-balls like Brad Hogg and Ravi Shastri do commentary clichés, and Bowden suspected an overstep. The umpire stopped Clarke from departing, radioed the third official and his suspicions were confirmed - it was a no-ball and the batsman was saved. Clarke's reprieve was short-lived; in Ishant's next over he could not evade a sharp and well-directed bouncer that lobbed off his gloves to Dhoni. The triple-strike caused a lunchtime re-evaluation from Australia, who had moved into a strong position while Watson was cutting and driving boundaries with ease. After the break, Simon Katich and Michael Hussey took a safety-first approach. Katich survived several close lbw decisions - including one against Ishant that Bowden wrongly called a no-ball - before he edged Pragyan Ojha behind for 37. That brought a tentative Marcus North to the crease, aware that he could have been on thin ice with the selectors even before his first-innings duck. He looked far from comfortable against Harbhajan Singh, whose angle from around the wicket kept the umpires in the game with several lbw appeals. Harbhajan had North caught at silly point for 10, his sixth failure in as many innings. In Harbhajan's previous over he had removed the obstacle of Hussey, leg before for 28, although he was unlucky as the fullish ball had pitched well outside the leg stump. Harbhajan and Ojha had strangled Australia's runs, and were now starting to kill off the batsmen as well. Tim Paine was caught in close off Ojha straight after tea, before Zaheer produced a fine display of old-ball swing by rattling through Australia's last three wickets to dismiss the visitors for 192. 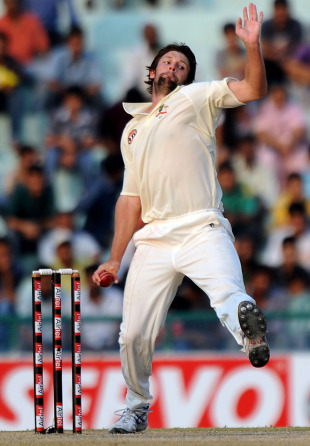 It looked like a professional enough job to hand victory to India, until Hilfenhaus proved he could match the effort. By the close of play, any punters expecting rain could find odds of 101-1 for a draw. It would be a very unwise gamble.